New Capsule Polisher Model YPJ-II manufactured in 304 Stainless Steel that meets GMP Standards. Comes with Variable Speed Control, Horizontal Cylindrical Nylon Brush. 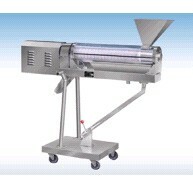 Unit can be adjusted for any type of capsule and has a capacity of up to 4,000 pieces per minute._Overall Dimensions: 52 inches in length x 17 inches in width x 48 inches in height, weight approximately 100 lbs. Electrics: 1Ph/60Hz/220Volts. Delivery Time: 4-6 weeks from receipt of 65% deposit.